Energy storage, rooftop solar panels and LEED construction used to be expensive, customized options for wealthier homeowners, but they are rapidly going mainstream. The combination of experience, economies of scale and advanced technology is making it possible for more home buyers — and renters — to live a low-carbon life. A case in point is a new Google Home-enabled partnership between two leading companies in the sustainability field, the global cutting edge energy storage company sonnen and the U.S. builder Pearl Homes. So, what comes next? The new partnership demonstrates what can happen when developers look beyond the benefits to individual home buyers, and design properties with an eye on the connected, distributed energy landscape of the future. Before getting into the details of the new partnership, it’s important to take note of the public policy context. Pearl and sonnen are pairing up to build a residential development called Hunters Point in Manatee County, Florida. That kind of climate action pitch might not touch a particular chord among prospective buyers in some areas. It will, however, resonate in Manatee County. Being sustainable remains in the forefront of decision making for Manatee County as leaders balance the environment, the economy, and the human/social needs of our community. As science, technology, and information change on the issues of sustainability, we adjust our path but consistently take steps toward this goal. 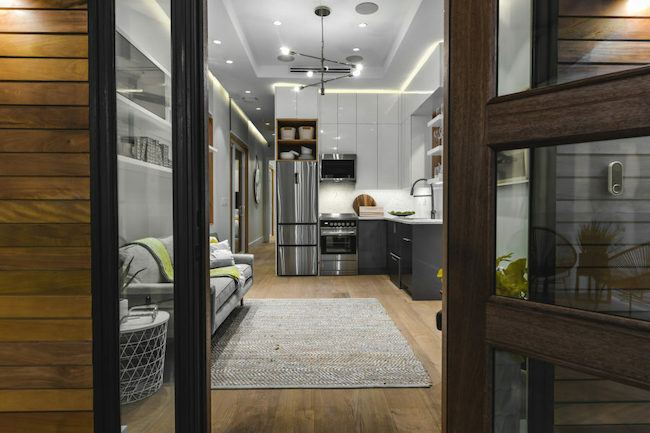 The network of homes…is the first community implemented by the sonnen-Pearl Homes partnership, one designed to help decarbonize Manatee County and surrounding regions of Florida by making green living affordable to a broader market. The takeaway here is that local governments with a strong sustainability mission can provide marketing support for the real estate industry as it pivots to meet the demand for more sustainable housing. In the case of Hunter’s Point, the sustainability message will be amplified by hundreds of residents. In addition to the 148 homes planned for Hunters Point, there will be a total of 720 rental apartments. As for the climate positivity angle, that’s where experience and advanced technology come in. Pearl Homes launched in 2015 with a splash when it broke ground on Mirabella, an award winning 158-home development of LEED Platinum homes in Bradenton. According to Pearl, economies of scale helped to bring its LEED costs down to within 5 percent of a conventional single family home. …From highly insulated walls and roofs, to high-efficiency HVAC and irrigation systems, to interior air quality, Mirabella offers sustainability and savings that few single-family home developments can deliver. The Hunter’s Point homes will have rooftop solar panels, a “smart” thermostat and an EV charging station. The energy storage and energy management angles are handled by sonnen. Home energy storage is a major expense, but the online solar marketplace EnergySage points out the obvious: batteries that store solar power can be an economical investment over the long term because they shave down utility bills. The sonnen energy storage system also provides homeowners with emergency power backup, an important consideration in today’s era of climate change and extreme weather. The combination of energy storage with LEED Platinum energy efficiency leads to a scenario in which Hunters Point homes could contribute more solar power to the grid than they consume — in other words, a climate-positive scenario. The climate-positive angle is maximized by the use of Google Home and its Nest smart thermostat technology. With Google Home on board, the developers can coordinate energy use, production, and storage across the whole community. All together, Hunters Point will account for 9 megawatt-hours of storage capacity and 7.2 megawatts of power. In conventional construction, a sizable new development could have a significant impact on the overall grid. With solar plus storage, Hunters Point can act as a “virtual power plant” that can contribute electricity to the grid when conditions are right. Sharing solar energy within the community also helps to minimize if not eliminate carbon impacts. All of this activity intersects with the trend away from central power plants and toward a more resilient power supply based on microgrids and distributed energy resources. Cloud-based software, the Internet of Things, automation and artificial intelligence all come into play in this arena. The full potential of microgrids has yet to be realized, but that could happen sooner rather than later. Nest, for one, has been working with software management companies to develop a distributed energy resource management platform (aka DERMS), which could become a significant means of accelerating clean power in the U.S. In the meantime, it’s worth emphasizing that sonnen and Pearl Homes understand that the future of home ownership looks very much like the electric vehicle (EV) revolution. EV’s are still pricey relative to gas-powered automobiles, but up-front costs are rapidly coming down, lifecycle costs are already competitive in some cases, public policy is supporting the technology transition, and consumers are beginning to grasp both the individual and the communal benefits of switching over to a low carbon lifestyle. Image credit (screenshot): Hunters Point Pearl Homes & Marina.